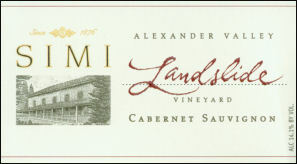 The composition of Simi's Landslide Vineyard Cabernet is roughly 84% Cabernet Sauvignon, 7% Cabernet Franc, 5% Merlot, 2% Petit Verdot, 1.5% Malbec, and .5% Tannat. It was aged for 26 months in French oak barrels. On the nose I get aromas of black raspberry, black cherry, dark chocolate, vanilla, creme, and cedar. There is also sweet camphor and tea leaf aromas that develop as the wine continues to open up in the glass.